This time ahead of the country’s clash against Argentina this Tuesday, the Leicester city player is boasting he will drown the Lionel Messi side, by scoring again today. 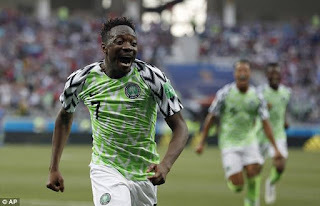 Recall Musa scored the two goals that gave Nigeria victory over Iceland in the Group D fixture of the ongoing FIFA World Cup in Russia. The Leicester City forward reckoned that he has always scored against the Argentina national team and Lionel Messi, stating that he has a target to continue his scoring streak against the La Albiceleste today.